Comprises of three tennis sets. And of course the teapot and sugar bowl. The finest of eggshell bone china. You will be the first to know of and sales or new arrivals. LAYBY is available. I'd be more than happy to let you know how it works. Made in japan. 16.5 cm spout to handle. $Welcome To Contact Us For Low Price Bulk Sale Please Attention The Wooden Tea Tray Showing In The Pictures Is Not Included In This Tea Set,Please Read Item Description Carefully For The Inclusion of This Tea Set - This Set Including 1 Teapot and 4 Cups - Made of High Quality Porcelain - Easy To Clean,Dishwasher Safe - Japanese Traditional Design - Cups With Unique Double Wall Design For Thermal Insulation - Teapot With Large Capacity - Cast Iron Detachable High Handle - Nice Sakura Pattern on Teapot and Cups - Stainless Steel Tea Filter Included - Teapot Height: 11cm Teapot Body Diameter: 17.5 Teapot Bottle Diameter: 10cm - Tea Cup Height: 5.5cm Tea Cup Bottom Diameter: 3cm Tea Cup Top Diameter: 6cm - Teapot Volume: 950ml Tea Cup Volume: 50ml. 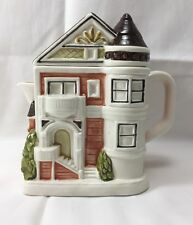 Size teapot is 17 cm h x 24 cm across handle to spout, milk jug is 10 cm high x 13 cm across to handle edge, double handled sugar is 13 cm h x 17 cm across edge of handles. Item: Teapot. Material: Ceramic. Made in: Japan. Be aware colours may vary due to colour settings, screen type and device type. Photo evidence is required. Features lovely gold tone art work artwork and is a mint green colour. TEA POT - 14cm wide incl. side handle x 6.4cm rim x 9cm high handle. traditional set = egg shell white hand decorated with Japanese scenes in orange with gold highlights, blue & gold banding. 8 piece JAPANESE TEA SET. Hi there For sale is a signed porcelain Japanese Kyusu teapot with a matching cup in excellent vintage condition. Mum purchased these back in the 1990s at an antique market and i have no idea how old they are. I have listed them as used but they were safely placed in a cabinet and never used and have no cracks or chips that i can see. The teapot is approximately 11 cm high and 13 cm wide including the handle. The lidded cup is approximately 8 cm high and 7.5 cm in diameter. Both are beautifully decorated as you can see by the photos. Thanks for stopping by. HEIGHT OF POT APPROX 12 CM MADE IN JAPAN SZ2365. WICKER HANDLE. MULTI COLOURED - WHITE, BLUE, GREEN, PINK. FINE CHINA. 1x Tea Pot. Strainer is installed inside the tea pot. Pot: W10.5cm, H9cm. Made in Japan. Colours: Brown. Gorgeous little one-cup teapot marked Made in Japan. I am culling my teapot collection and have several others for sale. 1x Tea Pot. Strainer is installed inside the tea pot. Pot: W9cm, H7.5cm. Made in Japan. Colours: Brown. Textured white background, decorated with delicate birds on branch and script, speckly brown details to handles & rim edge. TEA POT - 7.5cm base x 13.4cm wide x 7cm high - sealed with tape. 7 piece JAPANESE TEA SET. Vintage Porcelain 4 Piece Mini Teapot, Teacup And Saucer, Poem Sanmyro Japan. TEAPOT WITH STRAINER AND BAMBOO HANDLE. 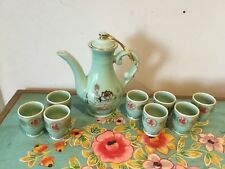 CHINESE ORIENTAL TEA SET. Depicts Cats. It is not a complete, but there are 38 pieces in total. Overall, they are in excellent condition, with the pretty pink rose and the grey undertones of the stem and leaves. 1 x teapot : 18 cm H x 18 cm L x 9 cm w.
1 milk jug. Teapot 15 cm high plus 5cm lid. It features a gorgeous grape and leaf design with gold handles and edging. Ocean Queen P.O.T. 1 tea pot and lid. 1 sugar bowl and lid. Made in Japan. TEA POT with cane handle - 14.5cm wide x 8.5cm high excl. 3 piece JAPANESE TEA SET. speckled off - white background decorated with brown outlined flowers, hand colouring in red & blue. 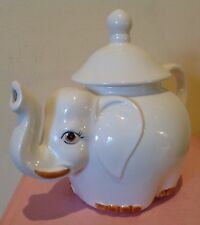 An Asian export ware porcelain teapot in excellent used condition. Has a ceramic strainer insert. WITHOUT THE TEAPOT HANDLE IT STANDS 140 MM HIGH X 190 MM WIDE. NOTHING ON BASE. ONE FOR THE TEAPOT PEOPLE OR THE JAPANESE CHINA COLLECTORS. Chinese style teapot with man and foral pattern. Size - 19 x 17cm. See photos, small chip on spout as pictured. The main body of the teapot is 115mm wide x 115mm high. The overall size from base of pot to the top of extended handle is 210mm. Tiny sign of wear on the underside of the lid. I've tried to highlight it in the pics but it's very hard to see. 3 piece miniature JAPANESE TEA SET. Lidded TEA POT - off white with tubeline decoration of flowers & butterflies - 13.5cm x 8.7cm wide x 7.5cm. Original BOX - light wear to outer. The colours are still vibrant. There is a couple of blemishes to one side plate. It looks like a crack but does not go all the way through. There is a chip to the edge of one cup. Otherwise all in very good condition. This vintage teapot is in good condition with no chips or cracks. The brass handle could use a polish. It measures 13.6cm high. Size approx. teapot- 11 cm wide, 9 cm tall to top of lid. Copper wire and bamboo handle. Pretty cherry blossom design. 250 ml capacity- perfect for serving green or herbal teas. A very beautiful tea pot with wired wood handle which is wrapped in plastic cord. More information at. The item will be bubble wrapped and boxed. This lovely teapot is in very good condition with no cracks or chips and the wicker handle is undamaged. The cream ceramic has an overall subtle crackle or crazing. It’s approximately 13cm tall (not including handle and 11.5cm diameter. If you like you can check out my other items, I am happy to combine postage and PICK UP is available from Katoomba 2780. I can always post overseas so feel free to ask for a postage quote. returns will only be accepted if the item is not as described. 1x Tea Pot. Strainer is installed inside the tea pot. Pot: W9cm, H8cm. Made in Japan. Colours: Brown, Blue. Handle: L5.5cm. "LOVE STORY COURTING COUPLE". BEAUTIFUL LUSTRE JAPANESE TEAPOT. Pick up is available in NSW Campbelltown 2560. Marked: Japan. 1x Tea Pot. Strainer is installed inside the tea pot. Pot: W10cm, H8.5cm. Made in Japan. Colours: Brown, Green. A Japanese teapot with swing handle. Has been used and there is a minor repair to end of spout. Otherwise in good condition with makers mark on the lid. Has a green leaf design. All glassware ceramics etc will be carefully wrapped in bubble wrap. 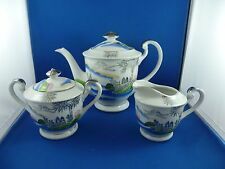 Sango Trio of Teapot, Lidded Sugar and Milk Jug or Creamer Splendor Pattern #3560 Bone China Made in Japan 1986-1989 The teapot stands 13cms to top of pot and 18cms to top of knob and holds a little over 3 cups The lidded sugar is 11cms to top of knob high and the milk jug stands 9.50cms to top of lip No chips, cracks or cutlery scratches. I am happy to combine items. The milk jug is 12.5cm tall and the sugar pot is 14.5cm tall. HEIGHT 10CM. RED, BLACK, WHITE. QUALITY TEAPOT. LOVELY LITTLE TEAPOT HAS A LOT OF CHARACTER. MADE in JAPAN. WITH ORIGINAL STICKER. It would be a great addition to any collection. Vintage Lustre Ware Plate Floral Bouquet Design "Nagoya Japan A.C.G"